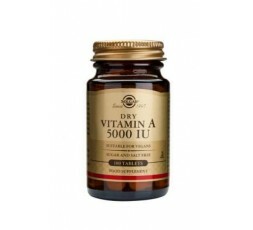 Solgar Dry Vitamin A 1502ug (5000iu) Tablets are derived from a natural dry source of Vitamin A (palmitate). GROWTH AND DEVELOPMENT - Vitamin A influences growth and development due to its effects on the syntheses of glycoproteins, which in turn may maintain proper cellular function and expression of genes. Deficiencies of Vitamin A are especially apparent in the lining of the cornea in the eyes, respiratory tract, intestinal tract, skin, urinary tract and the ducts of secretory glands. SKIN HEALTH - Vitamin A influences the cellular production of mucin and keratin and supplementation has been shown in research to benefit various skin disorders (e.g. acne, psoriasis). EYE HEALTH - Vitamin A is needed by the rods and cones in the eye's retina, responsible for night and daytime vision respectively. Low Vitamin A levels can cause impaired adaptation to changes in light and poor vision. RESPIRATORY HEALTH - Vitamin A is essential for the integrity of the epithelial lining and protective secretions of the respiratory tract. IMMUNE FUNCTION - Vitamin A possesses antiviral and immune-enhancing properties and is essential for proper function and growth of the thymus gland (the master gland of the immune system). 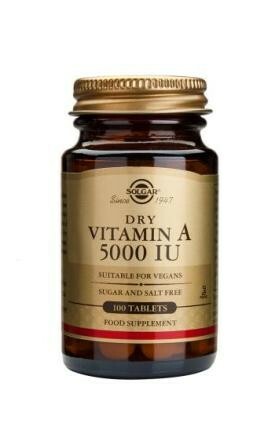 Take 1 Solgar Dry Vitamin A 1502ug Tablet daily, preferably at mealtimes, or as directed by a healthcare practitioner.